According to the Establishment employment survey, total year-over-year payroll employment growth fell to 1.7 percent during December 2015. This was the lowest growth level seen since October 2011, when the growth rate was 1.6 percent. Growth rates have not fallen off this quickly since 2008, although the growth rate itself remains at relatively robust levels compared to the last economic expansion between 2003 and 2008. In terms of employment totals, there were 1,398,000 payroll jobs in December 2015, compared to 1,374,000 payroll jobs one year earlier. That's an increase of 24,000 jobs over the year. So, we're still looking at increases, but the rate of increase in each month has been falling. 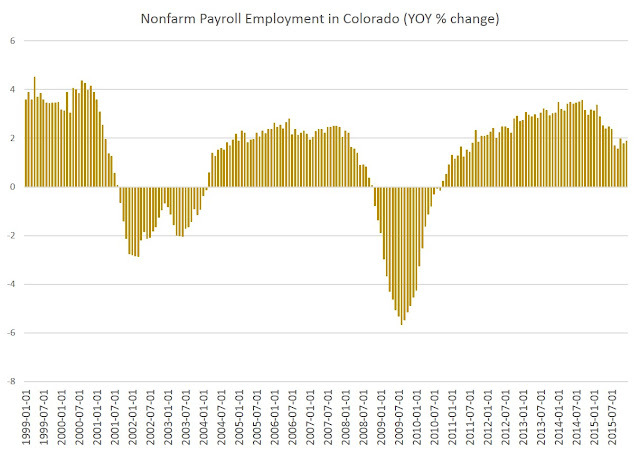 Unless this trend reverses itself, of course, we will be facing negative job growth by the end of 2016. 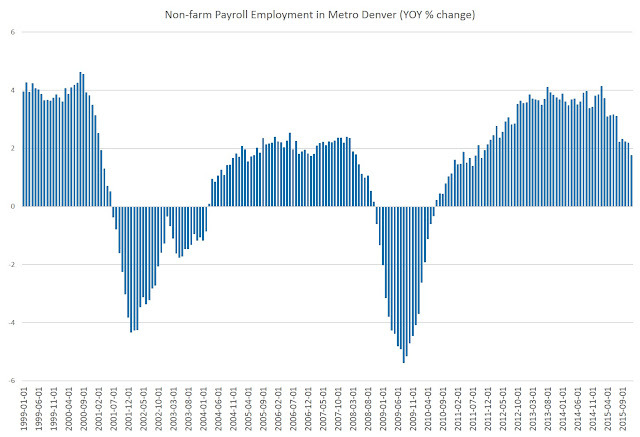 The measure I'm using here is total nonfarm employment for the Denver-Aurora-Lakewood MSA, not seasonally adjusted. The metro Denver numbers show a bit more of a downward trend although the overall percentage increases are pretty similar at this point. As of December 2015, the YOY growth rate was at 1.8 percent, which translates to a gain of about 47,000 jobs from December 2014 to December 2015. In total, there were about 2,559,000 payroll jobs in December. To compare to Denver, we might say that metro Denver was humming along with more growth than the state overall for much of 2014 and 2015, but both are now seeing growth around a little under 2 percent. Denver's growth rate has come down to match the state's rate. Statewide, growth is being helped along by Northern Colorado economies while it's being dragged down by sluggish job growth in Grand Junction and Pueblo. All data used in this article is from the BLS.